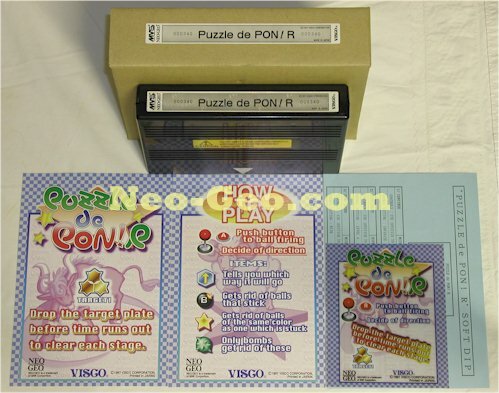 Here is another Neo Geo MVS arcade release, just like Captain Tomaday, that did not receive an official home CD or Cart release. Although, this time, fans were able to convert the data from the MVS cart to play on the CD system. This conversion can be found on the web. 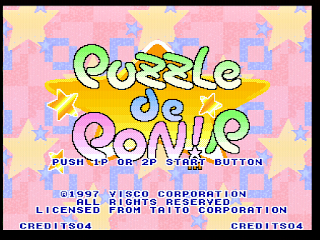 Otherwise, this game is discount-mart Puzzle Bobble. Just like the previous 3 Neo Geo game posts, I have attached a retro review I wrote, I think, in 1999. This is the last one I have have found, I still have hope I might find a review for Prehistoric Isle 2. Well, what is there to say about this game? I haven't played the original, but I am told this version is much better. In my own personal opinion, this title isn't worthy of its cost. 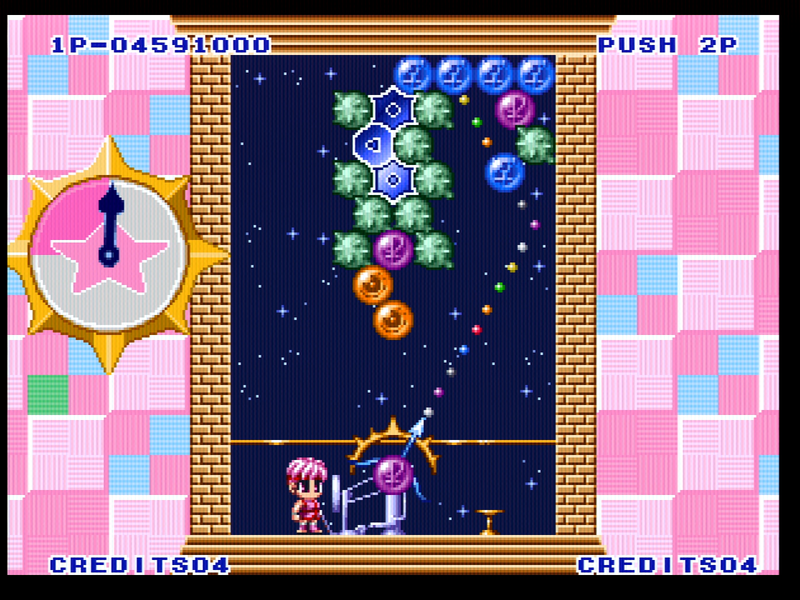 Basically it is Puzzle Bobble (or Bust-A-Move for us US/Canada folks) with a different object. 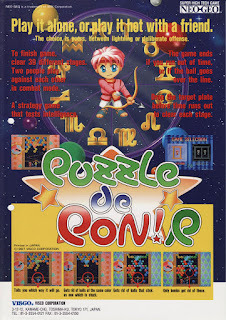 The object is to free the item that is in the center of the puzzle from the ceiling. No need to clear the boards like in PB. While that seems like an interesting twist, something in this game just gets to me. I don't know. Playing it on the MVS just doesn't feel the same as playing PB. And the graphics also seem to lack some of the vividness PB had. Maybe I'm being a little harsh, but for a game made 3 years after PB, and nearly identical in graphics and gameplay, I expected more. 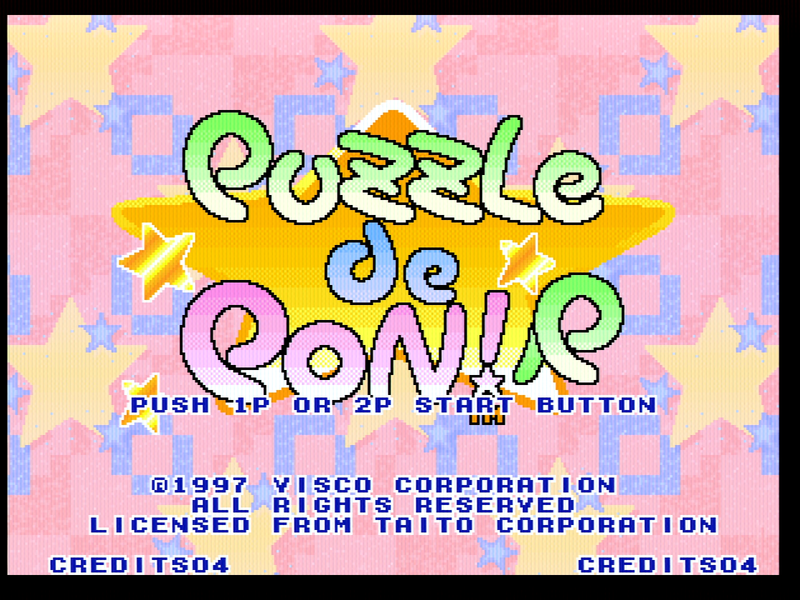 For those who have never played Puzzle Bobble (the *BEST* Neo puzzle game! 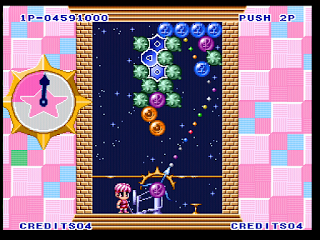 ), the object of the game is to clear the screen of all the bubbles that are holding the object that is in the center of the screen (the twist that makes this game different than PB). Once the object is free, the screen is completed. There is a time limit to complete this task. 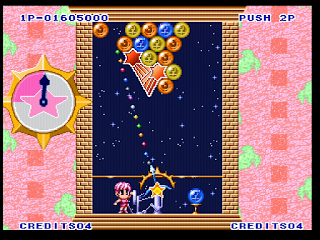 Unlike PB, the bubbles do not lower towards the player, so the game is a little easier. 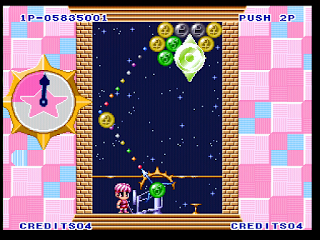 The same type of launcher is used, and all of the play physics are essentially the same (Visco replicated them well...). In my opinion, this game is not worthwhile. 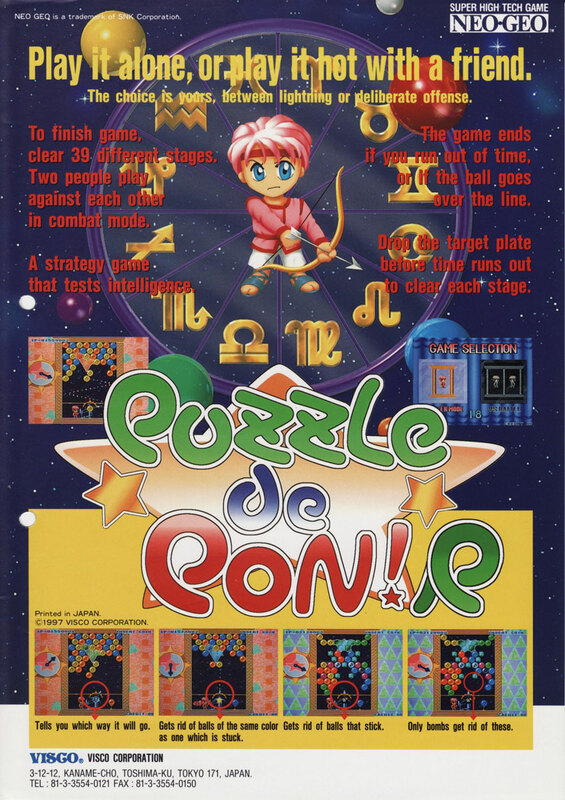 I would only recommend this game to people who absolutely love puzzle games, or completists who must have everything Neo Geo. The price I'd pay? Well, it might be worth $25. The going rate right now is $80-$120 for this game though. This gameplay was captured on December 24, 2018. 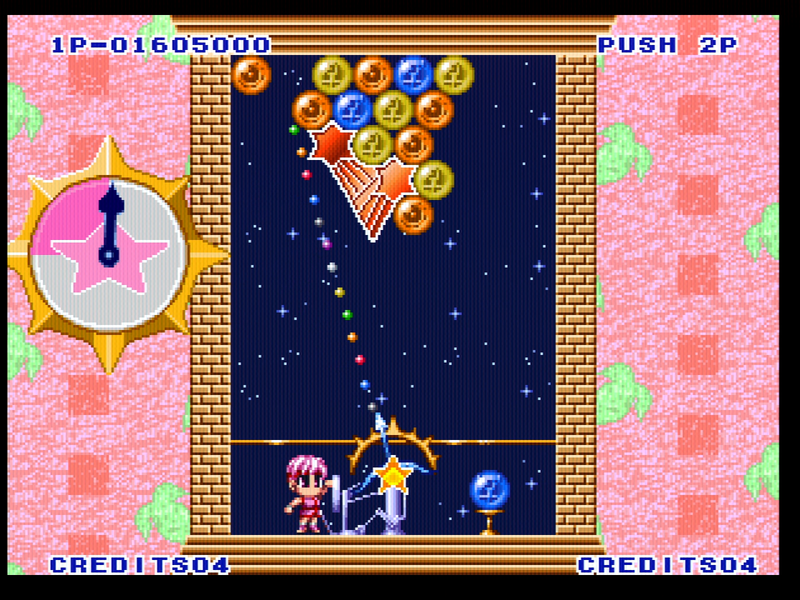 Game was played on a modded SNK Neo Geo home console, equipped with the UniBIOS.